Dime novelist Brianna Stark finds more than she expected in the small frontier town of Zephyr, Texas: not only a ready-made family in the form of six adorable orphaned children, but also a challenge in ruggedly handsome rancher Seth Van Dale, whose violent past may return to haunt him when tensions rise and the threat of a range war looms over everyone in Brown County. 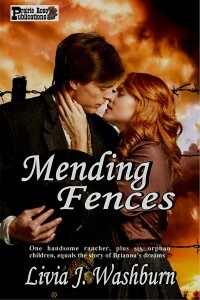 Based on actual historical events, MENDING FENCES is a riveting story of the Texas frontier as well as a touching romance between a heroine trying to find her place in the world and a hero whose past may destroy them both. BRIANNA STARK HAD heard the phrase "the middle of nowhere" many times in her life. She had even used it occasionally. But as she stepped down from the railroad car that had stopped in Zephyr, Texas, she realized that for the first time, she was actually looking at "the middle of nowhere." And it was not a pretty sight. Despair welled up inside Brianna. What had ever possessed her to come to such a place? There had been a sense of duty, of course, and a devotion to family, plus a practicality that was a strong part of her nature. Someone had to take care of those poor children, and since she was their only living relative, it made sense that the job would fall to her. But there was more than that, and as she looked deep inside herself, she knew what it was. Leaving Baltimore and coming out here to the wild frontier of Texas had been an idea full of the lure of adventure, something that had been sadly lacking in her life. Unfortunately, as she stood there next to the siding where the train had stopped, she could see no towering snow-capped peaks, no stretches of cactus-dotted desert, no endless herds of buffalo. Noble redmen in buckskins and eagle feathers were nowhere to be seen, nor were there any cowboys wearing chaps and high-crowned hats and six-shooters, men such as the ones who populated the dime novels she had been writing successfully for the past several years. Instead she saw gently rolling hills, dotted with timber, which rose gradually to the southwest into terrain that was a bit more rugged but hardly spectacular. She turned her head and looked up at the sign nailed over the door of the small, brick station building, just to make sure she was in the right place. Sure enough, the word ZEPHYR was painted on the sign. But where was the town? Brianna saw nothing but open country behind the depot and a large building a little farther up the tracks that she recognized as a cotton gin. Was that all there was to Zephyr? As if someone had read her mind, she heard a man clear his throat and then say, "Excuse me, ma'am, but the settlements on the other side of the tracks." Brianna turned around and saw the conductor standing on the platform between the car from which she had climbed down and the next one in line. He grinned and jerked a thumb over his shoulder. Brianna began to feel warmth spread over her face. "You mean I disembarked from the wrong side of the train?" she asked. "I'm afraid so, ma'am." The conductor leaned down to offer her his hand. "Here, let me help you..."
"No, thank you. I can manage just fine." The words came out sharp and stubborn, the way they always did when she was embarrassed. Her trunks had not yet been unloaded, so all she had in her hands was the small carpetbag she had kept with her in the car during the long journey from Baltimore. Awkwardly, she made the long reach with her right foot to the bottom step of the platform. She should have known she was getting off the train on the wrong side, she told herself. If she had waited, the conductor would have been along to position his portable steps so that climbing down would be much easier. She had just been in such a hurry to see the place that was going to be her new home. Still, this was quite an inauspicious beginning, she thought, and she wished there were some way to do it over. That was one area in which fiction writers such as herself had an advantage over other people. Mistakes could simply be crossed out. Brianna brushed that thought from her mind as the conductor took her arm and escorted her across the platform. She wanted to pull away from the man, but she reminded herself there was no need to be rude. As she stepped down from the train and looked to the east, she saw that there was indeed a town here, but it was not much more impressive than the view to the west had been. A single row of buildings was laid out along the railroad tracks, the most impressive of which was Wilson's General Mercantile and Post Office. Brianna also saw a drugstore, a grocery and hardware store, a blacksmith shop, a lumberyard, a barbershop, and a church, along with several other buildings. There was no school as far as she could see. At the north end of town she spotted the barns and corrals of a stockyard. She had been told in the letter she received from the lawyer representing her sister's estate that the ranchers in the area drove their cattle to Zephyr to be shipped out on the Santa Fe Railroad. If not for the ranches, Zephyr probably would not exist, though farming was also beginning to spread into this part of Texas from the east. Brianna had studied the area as thoroughly as she could before leaving Baltimore, the same way she approached any new undertaking. "Was somebody supposed to meet you, ma'am?" the conductor asked from the platform behind her. Brianna hesitated, and then looked back at him. "I . . . I don't know," she said, not liking one little bit the uncertainty she felt. "I wrote a letter to an attorney in Brownwood, and he was supposed to notify my family that I was coming." "Oh, you've got kinfolks here. Then you'll be all right." The conductor called down to a porter who was taking several small trunks and a large crate with holes in it from the baggage car and putting them on a cart. "Bring Miss Stark's things up here, Jim." The man touched a finger to the bill of his cap. "We'll be moving on now, ma'am. Enjoy your stay." The porter rolled the cart carrying Brianna's bags along the train until he reached her and unloaded them. He smiled and nodded to her, then headed back to the baggage car, where he swung up through the open door. The conductor had already disappeared into one of the cars, and a moment later with a shriek of its steam whistle, the locomotive lurched forward. Brianna stepped back as the train began to roll away. She felt an unaccountable sense of loss and desertion. Coming to Texas might well turn out to be the worst mistake she had ever made in her life. Zephyr, Texas, is a real town, and the fence-cutting war described in this novel actually took place in Brown County in the 1880s. However, for the purpose of this story, several minor changes were made in the geography and history of the settlement. The battle between the fence-cutters and the Texas Rangers, acting together with several local ranchers, was moved to the Zephyr area from its actual location on the ranch of W. M. Baugh, northwest of Lake Brownwood. Fence-cutting did occur in the area around Zephyr, and some of the fences that were cut were repaired and are still standing and in use today. Zephyr's other claim to fame is the Zephyr Cyclone, a massive tornado that struck the town on the evening of May 29, 1909, killing thirty-four people and destroying practically the entire settlement. In terms of lives lost and damage done, the Zephyr Cyclone was one of the deadliest, most violent storms of its time. But with the same spirit that moved the pioneers to settle Zephyr in the first place, the town was rebuilt and life went on. My father-in-law, Marion Reasoner, was raised in and around Zephyr. I was indebted to him for his assistance in the researching of this novel, as well as to my husband, James Reasoner, who first told me of the area's colorful past.